Specialty Products has the Water Infrastructure industry’s needs covered – Specialty Products, Inc.
As the WEFTEC Water Quality Event quickly approaches, SPI is highlighting products relating to water infrastructure. These are just a few of the applications for our diverse and innovative lineup of polyurea coatings. Open the WEFtec-Flyer-Final to see it in full color! 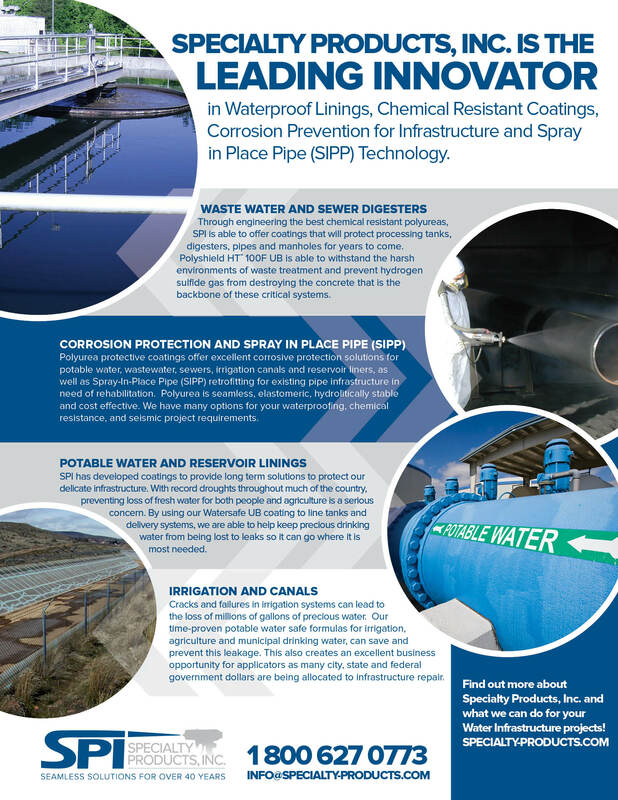 SPECIALTY PRODUCTS, INC. IS THE LEADING INNOVATOR in Waterproof Linings, Chemical Resistant Coatings, Corrosion Prevention for Infrastructure and Spray in Place Pipe (SIPP) Technology. Through engineering the best chemical resistant polyureas, SPI is able to offer coatings that will protect processing tanks, digesters, pipes and manholes for years to come. Polyshield HT™ 100F UB is able to withstand the harsh environments of waste treatment and prevent hydrogen sulfide gas from destroying the concrete that is the backbone of these critical systems. Cracks and failures in irrigation systems can lead to the loss of millions of gallons of precious water. Our time-proven potable water safe formulas for irrigation, agriculture and municipal drinking water, can save and prevent this leakage. This also creates an excellent business opportunity for applicators as many city, state and federal government dollars are being allocated to infrastructure repair. Polyurea protective coatings offer excellent corrosive protection solutions for potable water, wastewater, sewers, irrigation canals and reservoir liners, as well as Spray-In-Place Pipe (SIPP) retrofitting for existing pipe infrastructure in need of rehabilitation. Polyurea is seamless, elastomeric, hydrolitically stable and cost effective. We have many options for your waterproofing, chemical resistance, and seismic project requirements. 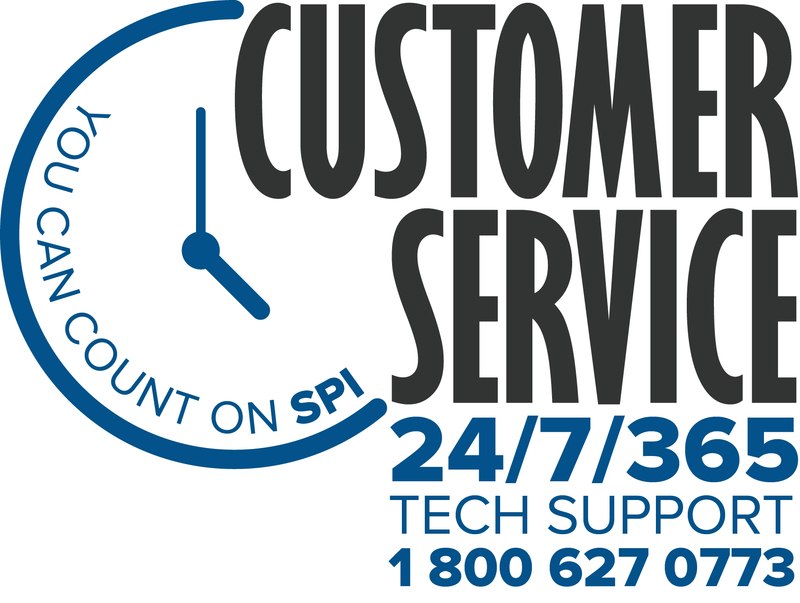 SPI has developed coatings to provide long term solutions to protect our delicate infrastructure. With record droughts throughout much of the country, preventing loss of fresh water for both people and agriculture is a serious concern. By using our Watersafe UB coating to line tanks and delivery systems, we are able to help keep precious drinking water from being lost to leaks so it can go where it is most needed. Find out more about Specialty Products, Inc. and what we can do for your Water Infrastructure projects!